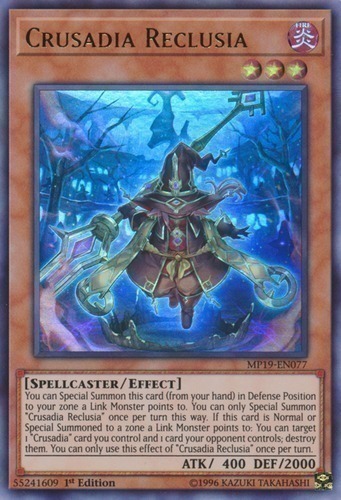 Text You can Special Summon this card (from your hand) in Defense Position to your zone a Link Monster points to. You can only Special Summon "Crusadia Reclusia" once per turn this way. If this card is Normal or Special Summoned to a zone a Link Monster points to: You can target 1 "Crusadia" card you control and 1 card your opponent controls; destroy them. You can only use this effect of "Crusadia Reclusia" once per turn.